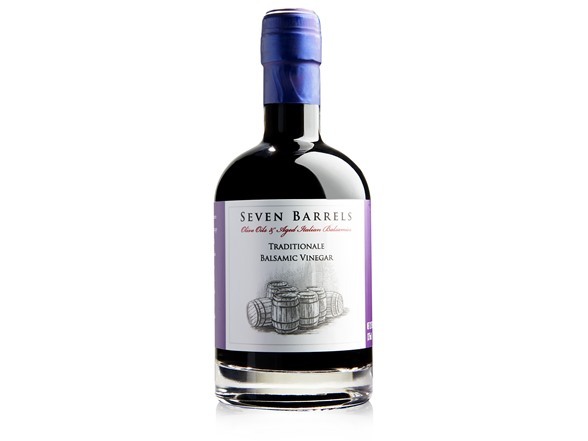 (1) - Seven Barrels Balsamic Traditionale Vinegar - 12 oz. Using the time-honored Solera process discovered over one thousand years ago in Modena Italy, this hand-crafted barrel-aged Traditionale embodies all the discriminating gourmand could hope for when seeking a premium Balsamic. A deep glossy brown color, our Traditionale offers a strong finish yet with velvety undertones. Free of any thickeners or coloring, offering an acidity of just 4.5%, and possessing a scant 45 calories per table spoon serving, our Traditionale offers a rich, delectable, yet healthy compliment to a myriad of different salad, vegetable, cheese, and meat dishes like no other. 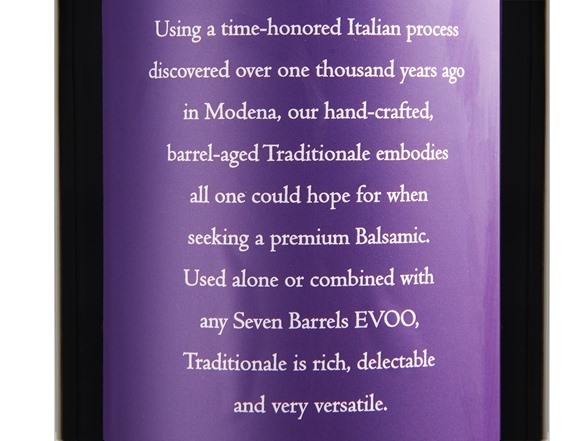 Our Traditionale Balsamic Vinegar is brought into Northern California from Italy and bottled in Sonoma. Actually, quite a lot when talking about Seven Barrels. Our name pays homage to the centuries-old process used to create rich and flavorful Balsamic Vinegar. Seven Barrels continues to use this process today to create the highest quality Balsamics you’ve ever tasted. The story begins with Trebbiano grapes grown in and around Modena and Reggio Emilia, Italy – the only places in world where Balsamic Vinegar is made. 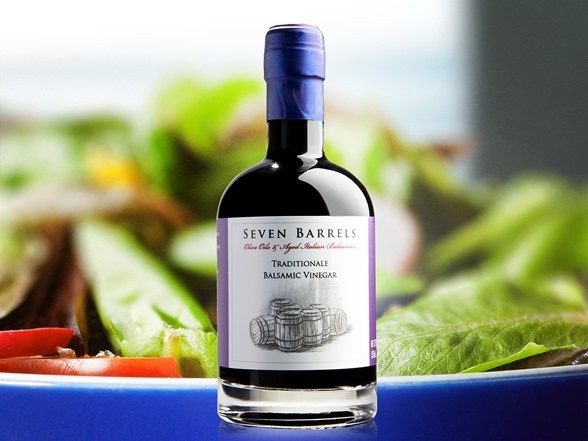 True Balsamic Vinegar like Seven Barrels, is aged for many years using a method requiring the vinegar to be moved through a series of as many as seven barrels of decreasing size. The barrels are made of seven different types of wood: oak, chestnut, acacia, cherry, mulberry, ash and juniper. Each wood makes its own contribution to the complex, nuanced flavor that will be the ultimate result. And Seven Barrels goes one step further. Along with straight-from the-barrel Balsamic, we infuse a selection of our vinegars with the finest fruits, herbs and essences to create new and exciting taste experiences. We also take the same meticulous care creating our top-quality Olive Oils. Our cold-pressed Extra Virgin Olive Oils come from California’s finest olive-producing regions. Along with our classic Olive Oils, we offer a selection of oils infused with fresh fruit and herb essences including Blood Orange, Basil, Rosemary and many more. So what’s in a name? 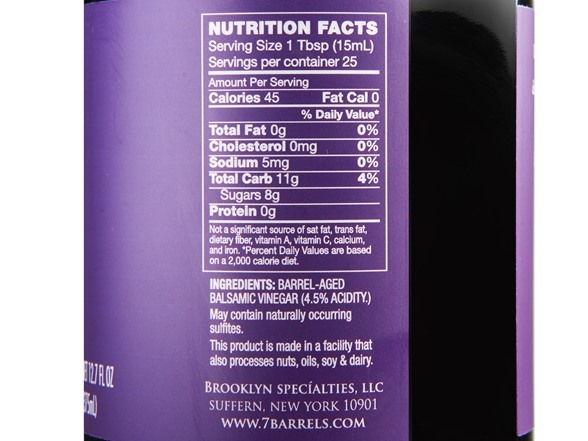 Try Seven Barrels today and find out!